There’s just three weeks left in September, which means you only have three more weeks to max out your Chase Freedom third quarter category bonus. 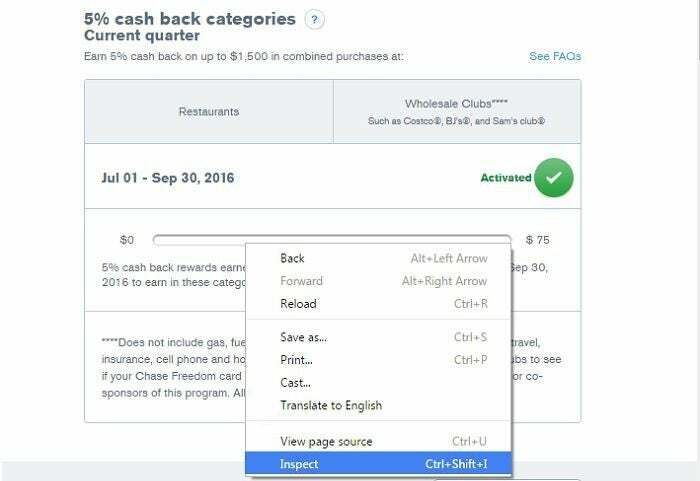 In case you missed the announcement, you’ll earn 5% cash back (or 5x Chase Ultimate Rewards points) on restaurant and wholesale club (Costco, BJ’s and Sam’s Club) purchases. This 5%/5x return is limited to the first $1,500 in qualifying purchases made during the quarter. You must register here by September 14 in order to be eligible. 2. Click your Ultimate Rewards balance to bring up the Chase Ultimate Rewards site. 3. If you have multiple Chase accounts, you’ll have to select the Chase Freedom account. 4. The next page should include a progress bar at the bottom right part of the screen. This shows a visual estimate of how much you’ve spent in category spending. If you want to know exactly how much progress you’ve made toward the Q3 bonus, right-click on the bar and select Inspect. This will bring up the code for the website. Don’t worry, you don’t have to understand most of it. Just look for the dollar amount on the highlighted line. This is going to be your progress toward the maximum $60 bonus ($1,500 x 4% bonus in addition to your normal 1% earnings). If you’re not already a cardholder, now’s as good a time as any to sign up. The Chase Freedom is still offering a sign-up bonus of $150 (or 15,000 Ultimate Reward points) after you spend $500 in the first three months. If you sign up now, you should get your new card in time to put a few meals on it — or maybe one large run to Costco, BJ’s or Sam’s Club. You can redeem points for cash back (100 points = $1), or transfer them to Chase Ultimate Rewards if you have the Chase Sapphire Reserve, Chase Sapphire Preferred, the Ink Plus Business Card. From there, you can transfer Ultimate Rewards points to travel partners like Southwest, Hyatt and United. Are you maxing out your Q3 bonus?